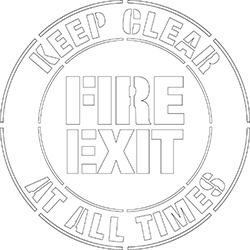 Use this Fire Exit stencil anywhere you need to make your exit points clearly visible. The stencil creates a high-impact sign on the floor, directing people to where they need to go. The stencil material is durable and can be reused many times. Excess paint can be wiped off easily to keep it clean and ready for storage.